The Tax Foundation notes that Californians who just filed their tax returns this week still have not worked long enough or earned enough money to pay off their tax bill for the year. To do that the foundation says they need to work nearly a week longer until they’ve collectively paid enough to the State government. Your tax dollars are at work paying for Sanctuary cities, schooling for the children of illegal aliens and painting Los Angeles roads white, ostensibly to combat global warming. Each year, the Tax Foundation calculate Tax Freedom Day, when Californians have earned enough money to pay their federal, state, and local taxes. It’s a sobering thought this far into the fourth month. Tax Freedom Day seems to push out further every year, this time, to April 19 for federal tax. Sadly, California taxes push that out to April 23. It could have been much worse! George Runner, Chairman of the California Board of Equalization says Californians can than Donald Trump for a reprieve. “The good news is, thanks to the Trump tax cuts, the tax burden for most Californians went down,” Runner said. 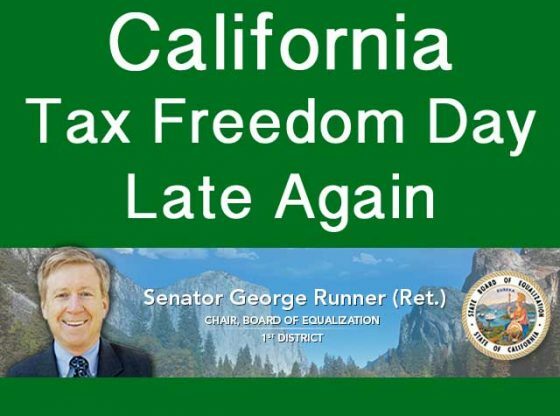 “Even with the federal tax cuts, Tax Freedom Day comes late again to California,” Runner added. Runner says California citizens don’t getting much value for the money they send to government. It could be time to pick up the phone, to call the legislature, to tell them what you think abut this. The Tax Foundation says that in 2018, Americans will pay $3.39 trillion in federal taxes and $1.80 trillion in state and local taxes, for a total tax bill of $5.19 trillion, or 30 percent of national income. That’s more than Americans will collectively spend on food, clothing and housing combined. Ranking 41 out 50 of states, California Tax Freedom Day arrives later than most states, and later each year.